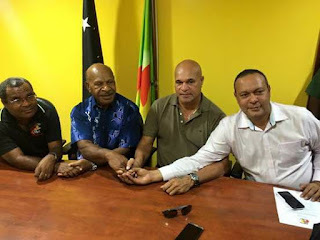 Pangu Pati leader Sam Basil has said that his defection to the government ranks wasn’t at all desperate for portfolios in the government but the move was to safeguard the party’s future in the coming months and in the 5 years term of the current government. “There may be casualties in moving into the government ranks or even remaining in the Opposition but in weighing the move as a responsible leader, the casualties of staying in opposition are greater than crossing the floor, said Mr. Basil. Mr. Basil also denied having any disagreements with the Opposition leadership saying he moved to the government with a good heart and believed in the leadership of Patrick Pruaitch as the Opposition leader. Pangu Pati also welcomed 2 new members into its camp, in Lae MP John Rosso and Lufa MP Moriape Kavori.